Had a great day with my MELD colleagues today. We stitched and critiqued as usual but a highlight was the handover of the images that my fellow MELD member Louise Wells’ son, Josh, had taken of our work. Josh Wells is a budding professional photographer (if that ‘s a meaningful term) who offered to shoot some of our work. Two images are on the MELD blog but here are the others. The MELD blog is at http://meldarts.wordpress.com. Basically the work celebrates the close bond between me and my grandson, whose little “gifts” to me as a toddler were all saved by me and are stitched into the work to represent the things I in turn wish for him as he becomes an adult. Seeds represent fertility. Money (20 cents) represents a wish that he have enough to meet his needs but not enough to skew his morality. A maze represents the life challenges he will have to navigate; while an apple segment signifies a wish for his health. The shells he gave me each time we went to the beach stand for his love of swimming. The feather that encases these objects, and the feathers he also found and presented to me, represent his longing to “have wings”. 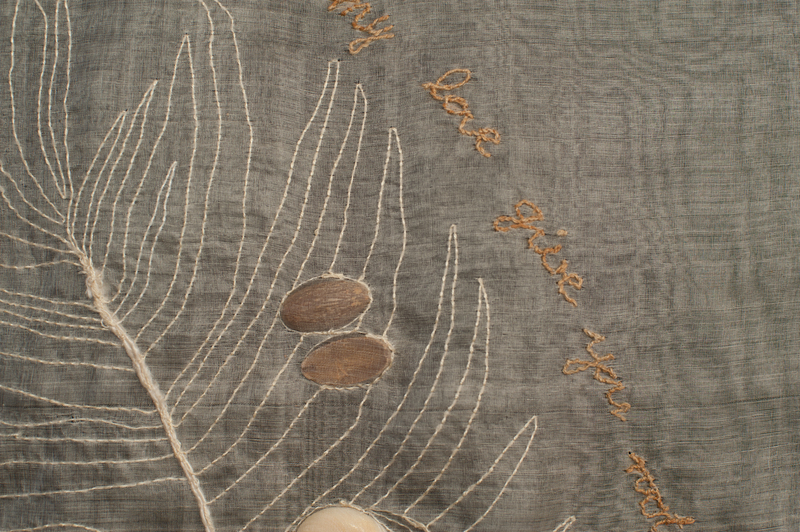 Finally, the words down the side of the feather are from a song by Mark Harris. Mark Harris’ words are: So let my love give you roots and help you find your wings. I Wish You Wings was exhibited at the Nyisztor Gallery in the Designing Women (http://designing-women-wa.blogspot.com.au) exhibition last year. 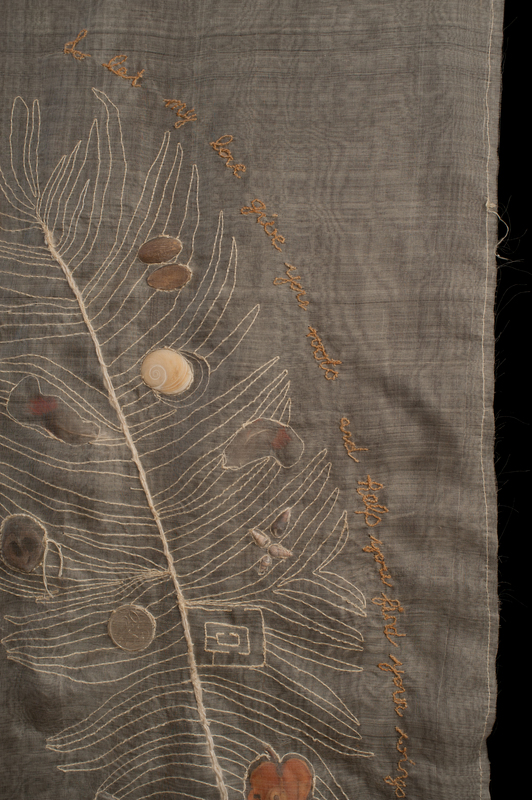 This entry was posted in found object, Hand embroidery. Bookmark the permalink.